Attempt to invoke virtual method 'void com.google.android.gms.maps.model.setIcon(com.google.android.gms.maps.model.BitmapDescription)' on a null object reference. when user pan on the map, markers will render. The issue goes away after removing the View + Icon children and leaving it as default icon. // Let it render one more time to avoid race conditions. //      image loaded but not rendered. I've encountered similar issue and no idea of the right solution. Please help. The PR fixed the problem for me at least. Is there a timeline when this could get merged and published? Thank you for the feedback. Is the any chance to make a release soon? Same issue here, tried the changes by @salah-ghanim , but in my opinion it makes nothing else than setting tracksViewChanges to false. And then we have the case that the markers will not update. When I set tracksViewChanges to false, my map will not show any markers on start. They will first appear when I zoom into the map. cluster.markerID && cluster.properties.point_count > 1 ? That PR solves it for me too. Any idea when this will be released? I am now pinned on a master commit. I have the same error. I am using react-native-maps-super-cluster module and it appears when using a custom marker view. @ZeroCool-85 my changes only do a nullability check. as for the crash you're receiving it might have something to do with the way the clustering library handles annotations, If that's your case (you're using a clustering library) I'd suggest you open an issue there. 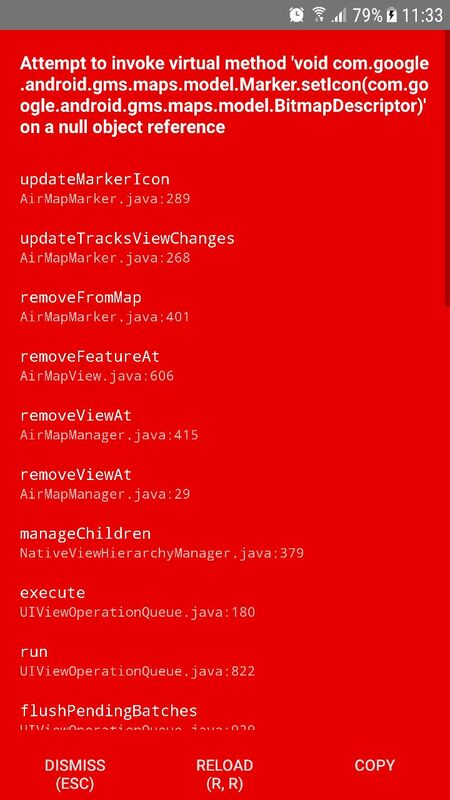 I am getting the same error on React Native Maps v0.22.1 though I am seeing com.google.android.gms.maps.model.l.a instead of com.google.android.gms.maps.model.setIcon but it looks like this is pointing to the same line AirMapMarker.java:289. I updated to the new version of Expo today 31.0.5 which points to expo/react-native-maps#v0.22.1-exp.0. expo/expo#2680 mentions that it should fix this issue. But I am still seeing the problem. Any advice on how I can troubleshoot this? @sjchmiela updated to the new Expo client and it's working now! For others, I upgraded by uninstalling Expo on my simulator and reinstalling it via the Expo CLI. I didn't realize that the Expo client packaged in the Expo code. I assumed it was coming from my node modules (which had the correct version of Expo RNM). Is there anything I can read to help my understanding of the architecture of Expo / React Native? versioned — copies of codebase as of SDKxx (expo/android/versioned-abis, expo/ios/versioned-react-native). To be able to compile all this in a single application (with unique class names as a requirement), we prefix class names (on Android we add abiXX_X_X at the beginning of package name example, on iOS we add ABIXX_X_X prefix to class/macro name example). Versioning scripts live in expo/tools. we have Gulp tasks to update our copy of the library (update-react-native-maps task). These tasks copy the library code into unversioned part of the codebase, renaming prefixes of the class names/packages. This makes third-party code more similar to Expo codebase in terms of naming, which in turn lets us run versioning script on those classes without many problems and have multiple versions of third-party libraries in one application. Apart from code that is subject to versioning there is also code that isn't versioned, sort of an entrypoint to the application, which binds these different environments. I won't explain it in much detail as the details aren't important to the discussed aspect of Expo, if you want, you can find it in expo/ios/Exponent/Kernel and expo/android/expoview/…/host.exp). When you run your experience with Expo Client, kernel fetches the manifest from your computer, checks requested sdkVersion and runs your JS bundle in a corresponding versioned environment. Whole JS bundle is built on your computer and this is where your node_modules kick in. Native code is already in Expo Client, waiting to be run.